Aladdin is one of those films that has a special place in the heart of a certain generation. Almost every millennial out there will remember going to see Disney’s 1992 classic as a kid, and being captivated by the songs, the scenery, and Robin Williams’ unforgettable performance as the Genie. What you may not have known is that there is currently a live-action remake of Aladdin in the works, which will hit theaters in May of this year. The remake has been a little controversial from the start, with a lot of fans questioning why Hollywood can’t just let the classics live, and come up with a new story for once. However, they have managed to get a few big names involved, including Naomi Scott, who will play Princess Jasmine. Even more eye-catching is the choice of actor for the role of the Genie – a certain Mr Will Smith. The picture above is a still that was taken from the teaser trailer, which dropped last night. 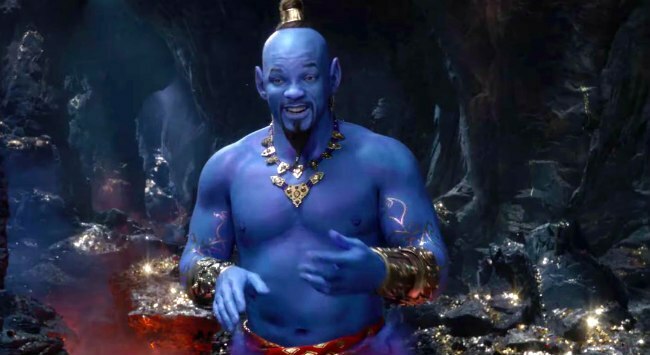 The trailer, which is a minute long, also features a small amount of dialogue from the Genie, who sounds… well, exactly like Will Smith. 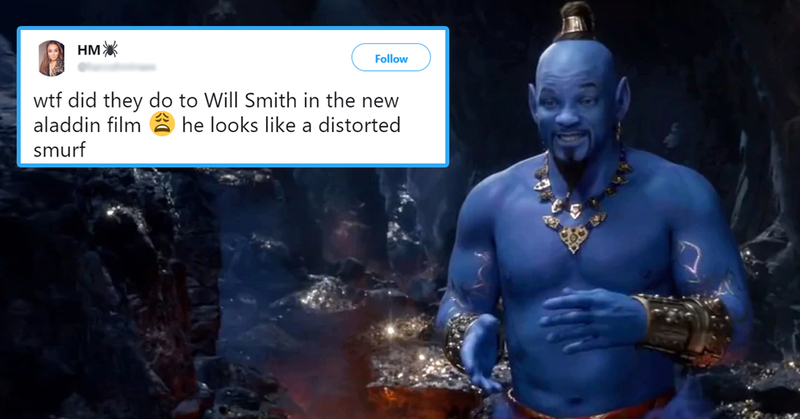 As much as we all love Will Smith – I mean, the guy’s a national treasure – it’s fair to say that the internet are not exactly convinced about his look for the role. It’s certainly a departure for Smith, who we are much more used to seeing looking the same as he has since his Fresh Prince days. The man just doesn’t age! Of course, it’s totally unfair to dismiss the movie on the basis of this teaser trailer. The movie has been produced by Disney themselves, so you’d like to think that the quality will be there. It’s just so hard to picture anyone else but Robin Williams as Genie! Taking the title role of Aladdin is Mena Massoud, an Egyptian-born actor who has only appeared in a handful of movies to date. It is being directed by Guy Ritchie, and hits theaters in the US on May 24th. Will you be going to see it? Let us know your thoughts in the comments.